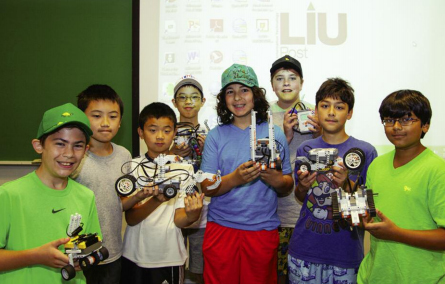 The Long Island University (LIU) program for gifted children was established in 1980 in response to the increasing recognition of society’s special responsibilities for children with demonstrably superior intellectual ability. The LIU Center for Gifted Youth brings together two important elements of education for the gifted: extraordinary teachers recruited from leading high schools, middle schools, and elementary schools in the metropolitan area; and university-level facilities. These two factors, combined with an administrative and psychological team schooled in the needs of gifted children, give the program at LIU Post unique strengths in producing positive benefits for young people admitted to the program. The Center for Gifted Youth’s underlying philosophy is the development of the intellectual potential of each child. Its purpose is to provide learning experiences for children with superior intellectual ability that will deepen and extend their intellectual interests, as well as develop the skills of independent learning. 1. To provide activities at appropriate levels and pace. 2. To provide opportunities for gifted students to relate to each other intellectually and socially. 3. To maximize problem solving and creative thinking experiences. 4. To focus on leadership development. 5. To increase self-awareness by promoting realization and acceptance of one’s capacities and an understanding of one’s needs and interests. 6. To stimulate aspirations and pursuit of higher-level goals. 7. To provide exposure to, and interaction with, stimulating and interesting adults. Technology Infusion Plan For gifted students, 21st century learning presents unique challenges. To ensure that students in the Center for Gifted Youth are well prepared for these challenges, we have updated our curriculum offerings. Our technology infrastructure offers students stimulating opportunities to experience cutting-edge resources. Among these resources will be media tools including net books and iPads. Many courses will be Internet-based and include such applications as a customized Google search tool, graphing calculators, and software animation programs from MIT. Our goal is to infuse technology within the framework of our program in order to provide a more challenging, meaningful, and appropriate educational experiences for our gifted students preparing them for diverse leadership roles in the 21st century. The Long Island University program for gifted children was established in 1979 in response to the recognition of society’s special responsibilities for children with demonstrably superior intellectual ability. The LIU Center for Gifted Youth offers extraordinary teachers recruited from leading schools in the metropolitan area, and university-level facilities.